“The Word of the Lord remains until in eternity. Hendrick Aeltsz. van Meurs (†1624) was a bell founder at Utrecht. The bell is ø 1.3 meters. In the beginning the tower was probably used as bell tower. 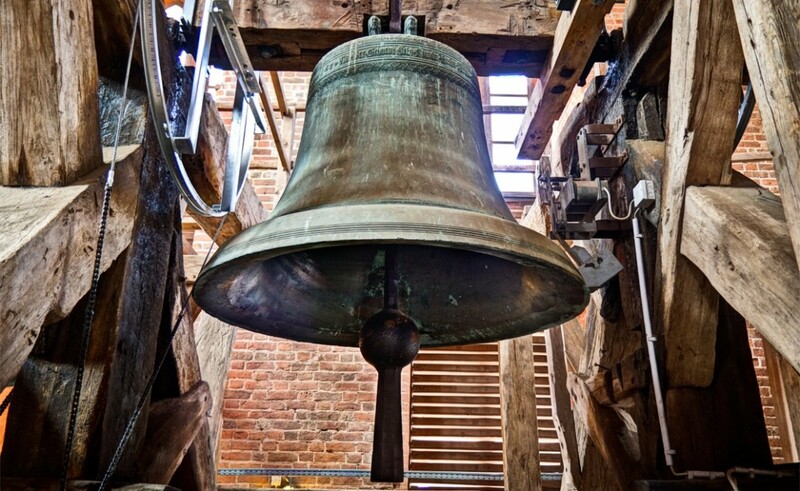 In later periods the bell was certainly used to strike the clock. In the 17th century a part of the tower was a prison.The big niche in the hall served the last years of the 19th century as prison. The door with the heavy bolts that closed the niche in 1900 can proof this. Th fire hose was stored here till 1936. This was even indicated on the front door. The hall was also a lumber room. The tower was not always the entrance of the churches in succession. Sometimes it was, sometimes it wasn’t. Until 1820 an important archive was locked in the south wall of the niche.